ViewSonic’s NexTV VMP75 streams Netflix, Flickr and media from your PC directly to your TV through a tiny, unobtrusive box. You are no longer limited to what’s on the hundreds of channels offered up by your cable or satellite provider. Now, many TVs, Blu-ray players and other boxes feature a plethora of third-party entertainment. However, if you missed the boat and aren’t quite ready to shell out hundreds or thousands of dollars on a new device, don’t fret. 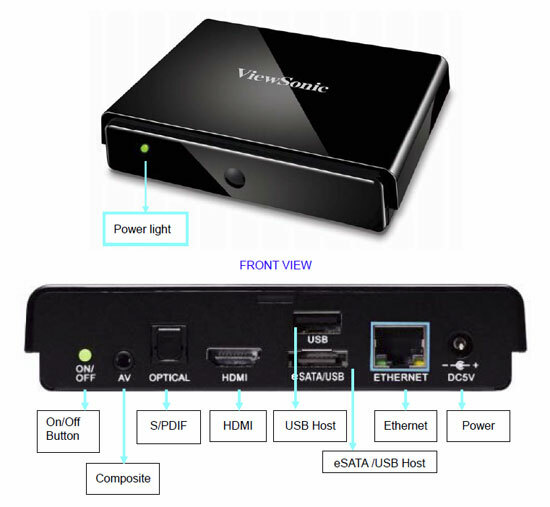 It’s just as easy to add those entertainment options in with a teeny box like the ViewSonic NexTV VMP75. There’s not too much packaged with the VMP75, which we actually appreciate. Aside from the actual media player, you’ll find an HDMI cable, an A/V composite cable, the power adapter, a Quick Start guide, and a remote with batteries. You should be up and enjoying alternate entertainment in minutes. At under half a pound, this unit should be a fleck inside your A/V cabinet. That’s the beauty of it. The front has nothing but a power LED. The back has very few ports, including composite A/V jacks, optical audio, HDMI, USB, a combined eSATA and USB port, Ethernet, and the DC power port. To make things simple, we went with the HDMI connection. It’s easy, it’s clean, and it helps deliver ViewSonic’s promise of streaming 1080p content. However, the company isn’t making that too easy. The one thing that this box is missing is built-in Wi-Fi. It can do wireless, but it will cost you a little extra for an adapter. At press time, ViewSonic did not offer its own wireless adapter for this setup, but recommends compatible adapters from Edimax, Azio, and Intellinet, which you can pick up for about $20 on the Web. One was not supplied for this review, so we went with our old Ethernet connection. That connectivity is important, though. Without it, well… you just have another pretty little box in your A/V cabinet. The Web is your key to content, which includes YouTube, Live365, ShoutCast internet radio, Flickr, RSS feeds, and Netflix (subscription required). The VMP75 box itself has absolutely no controls — not even a power button. Everything you want to do and everything you need to do will be done from the VMP75’s remote control. The remote is fairly straightforward, with 39 hard buttons and one click wheel.